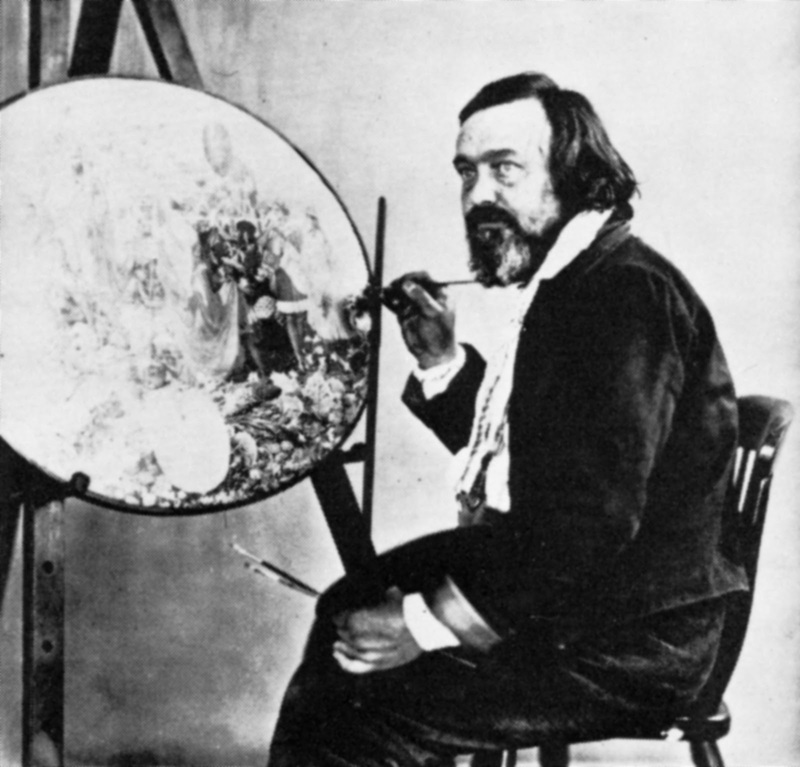 William Michael Rossetti once described the painter Richard Dadd as 'the ill-starred painter'. With his story being one of insanity, evil spirits, murder and fairies, this epithet was certainly well-chosen. Things, however, did not begin sadly for Dadd: born in 1817, he was a rising star of the art world, admitted into the Royal Academy at only 20, and member of a circle of aspiring young, Victorian painters known as The Clique. Yet, at twenty five, his life took a dramatic turn for the worst when, in the summer of 1842, he accompanied a patron, Sir Thomas Phillips on his Grand Tour of Europe and the Middle East. The pair were having a marvellous trip until their arrival in Egypt, during which time Dadd began to act peculiarly, something which Phillips put down to a case of sun-stroke. However, by the time they had returned to Italy, Dadd had become violent towards his travelling companion and was convinced he was being followed. What's more, in Rome, he had an incredible urge to assassinate the pope during a public appearance. On his return to England, Dadd became convinced that he was being plagued by spirits and ancient deities, most prominently that of the Egyptian god of the Underworld, Osiris, with whom he was obsessed and who constantly ordered him about. What was then labelled simply as 'insanity' we know now to most likely have been severe schizophrenia. ﻿﻿ On the night of August 28, 1843, Robert Dadd, the artist's father, accompanied his ailing son on a evening walk in a park in Kent. The next day, the bloody corpse of Robert was found near a pool. Richard had used a razor to clumsily slit his father's throat, stabbed him several times in the chest, then had fled immediately to Calais and onwards to Paris. He was later arrested there after attacking a fellow traveller with his razor, and was brought back to England, where he was incarcerated in London's infamous Bedlam, and spent the rest of his life in insane asylums. Whilst the picture I have painted is one of a madman, the pictures he painted, especially during his time at Bedlam were, irregardless, extraordinary. Indeed it seems that, for Dadd, painting was a calming release, and his jailers appear to have encouraged it. He not only painted canvases, but was allowed to paint murals on the prison's walls, and even design and decorate sets for its theatre. His paintings during this time, though portraying supernatural and arcane scenes, were nevertheless painstakingly and cool-headedly executed. No doubt his most famous work is The Fairy Feller's Master Stroke on which he worked for roughly nine years, and about which he wrote and long and rambling descriptive poem (a line of which graces the heading above). 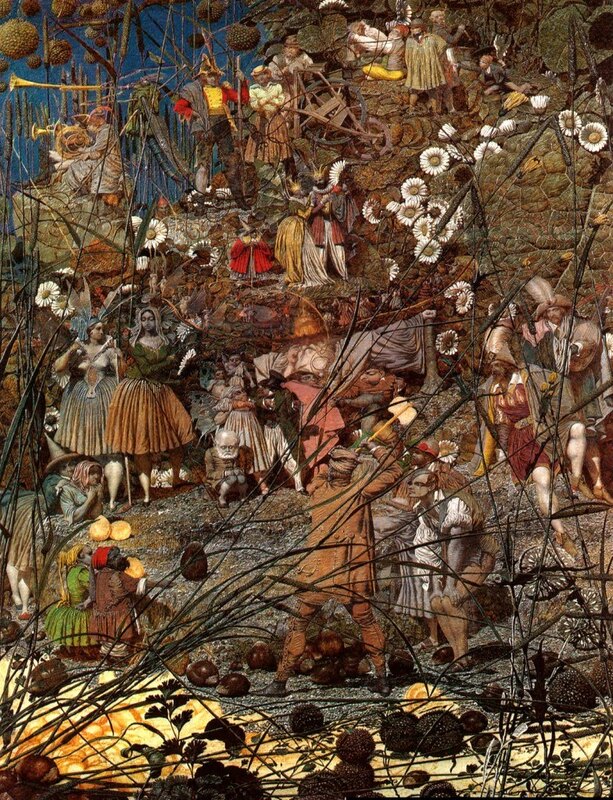 The scene is viewed through long blades of grass and shows a tiny glade filled with all manner of fairy folk who are anxiously waiting for their King to signal a wood-feller at the centre of the piece with his axe held aloft to cleave an acorn in two for the carriage of Queen Mab. I was lucky enough to see this painting on display at Tate Liverpool earlier this year, and I can say without hesitation that no photograph you will find can do the original work justice. Each swirling blade of grass obscuring your view, each daisy, tiny hand and delicate wing is astoundingly detailed and has the most incredible texturing one will ever see. One almost believes one could pick one of the tiny buds in your hand, they are so real. Every inch simply captivates the eye. Unsurprisingly, the piece has gone on to inspire writers like Angela Carter, Terry Pratchett and Neil Gaiman, and was even the basis for a song by Queen. Dadd's life was dogged by sadness, yet his evocative and beautiful work is a lasting testimony to the man and the artist behind the misery.